Losing to New England means that the stakes got higher for next Monday night's Vikings-Seahawks game in Seattle. You want the percentages, right? We have them here. In addressing reporters Monday afternoon, less than 24 hours after digesting a loss to the Patriots, Vikings head coach Mike Zimmer was asked to look ahead to a week from now when Minnesota plays its next MOST IMPORTANT GAME of the season. He agreed that there is added emphasis for a game against a conference foe that could be battling for one of the two same wild card spots the Vikings might find themselves trying to attain, but in crude (and rather humorous) parlance, Zimmer also noted that it doesn’t really matter if the Vikings win next Monday night if, after that, they relieve their bowels into their own hands and lose the next three. Fair enough, but let’s just focus on the Seattle game for a moment and what it means — not in the cosmic scheme of things, but in the context of the Vikings’ season. 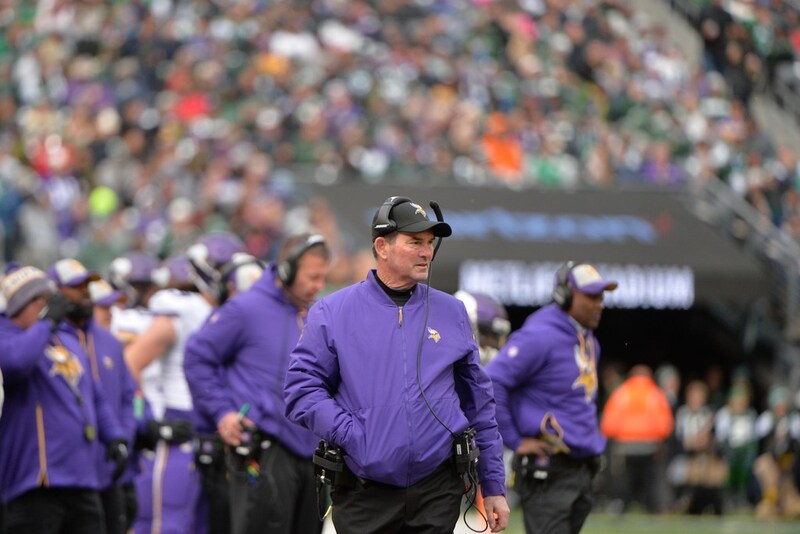 Video (03:41): Vikings head coach Mike Zimmer is concerned with the lack of consistency with Minnesota's playing, and after Sunday's loss to the Patriots he needs to figure out his team's problems. *As it stands now, 538 gives the Vikings a 57 percent chance of making the playoffs. I dare say that’s a little better than it was going into the Patriots game, and probably speaks to Carolina, Green Bay and Chicago also losing. *With a win at Seattle, the Vikings’ playoff chances jump to 84 percent, a 27 percentage point increase. This doesn’t factor in any other result, but just that one win would put the Vikings from shaky to much more firm ground. *A loss at Seattle knocks them down to 40 percent, a drop of 17 percentage points. That’s not good, but it’s not exactly gloom and doom. Basically, a win helps more than a loss hurts. A win over Miami the following week would put the Vikings back at 51 percent. *A win at Seattle combined with a Bears loss to the Rams would give the Vikings a 50 percent chance of winning the NFC North and overall give them an 86 percent chance of reaching the postseason. So yeah, there’s a lot at stake next week. But the biggest takeaway I have from this is that a loss to Seattle wouldn’t be fatal. A win, though? That could define the Vikings’ season and take them from a muddled mess to a better place.